The consumer code in Kafka Producer And Consumer Example so far auto-commits records every 5 seconds. Now let’s update the consumer to take a third argument that manually sets your offset consumption. If you use the value of the last argument equal to 0, the consumer will assume that you want to start from the beginning, so it will call a kafkaConsumer.seekToBeginning() method for each of its partitions. If you pass a value of -1 it will assume that you want to ignore the existing messages and only consume messages published after the consumer has been restarted. 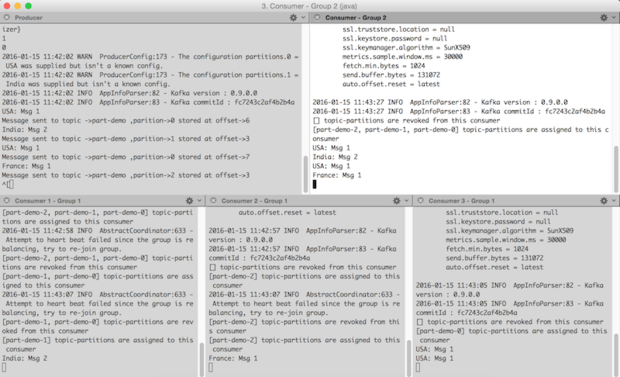 In this case it will call kafkaConsumer.seekToEnd() on each of the partitions. Finally, if you specify any value other than 0 or -1 it will assume that you have specified the offset that you want the consumer to start from; for example, if you pass the third value as 5, then on restart the consumer will consume messages with an offset greater than 5. For this it would call kafkaConsumer.seek(<topicname>, <startingoffset>). Below is the Consumer with adding a third argument to the consumer for the offset decision. Below is the Producer with adding a third argument for the offset decision. The Kafka client should print all the messages from an offset of 0, or you could change the value of the last argument to jump around in the message queue. The above Consumer takes groupId as its second parameter. Now we’ll use the groupId parameter to implement both queue and topic use cases for the consumer. Return to the producer console and start typing messages. Every new message you publish should appear once in the group2 consumer window and once in one of the three group1 consumer windows, as shown in Figure 3. This entry was posted in Big Data, Kafka and tagged Big Data, Kafka.